Main Product： It's main business scope inclding:BOPP Packing Tape , LLDPE Stretch Film ,Polythene Automatic Sticj Fresh Film ,Gummed Kraft Paper Tape,Stationery Tape,Printed Tape ,Karft Tape ,Double Sided Tape ,Masking Tape ,Duct Tape ,PE Warning Tape ,PVC Insulation Tape and ect. 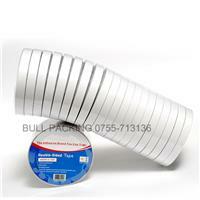 SHENZHEN BULL INSDUSTRIAL CO .,LTD was founded in 1993，it's main business scope including:bopp packing tape 、LLDPE strrtch film、invisible tape、duct tape、double sided-tape、masking tape and ect. How to ensure the goods is what you pick from our website ? We will send a piece of goods to our client as the sample so that they can know whether the goods that they picked is what they are looking for or not. How to make payment if you want to buy ? We accpet T/T ( Telegraphic transfer )as the payment. What kind of Trade Term we can accpet ? We accpet FOB,CIF,CNF,EWX as the Trade Term. What if you need to repair ? We can also provide the component for you. Why should choose us ? 1. We have a professional team, rich experience and high quality products and excellent after sale service. 3. We are able to customize and design for our customer. 4. Our process is efficient, accurate, convenient, fast. 5. We can solve difficult problems for customer in time. 6. Customer demand is our mission. 7. All for customers, for all customers, for customers of all. The more the trust is,the less suspicion is! The cooperation starts from here.